Find the right tour for you through Kharkhorin. We've got 68 tours going to Kharkhorin, starting from just 3 days in length, and the longest tour is 129 days. The most popular month to go is July, which has the most number of tour departures. 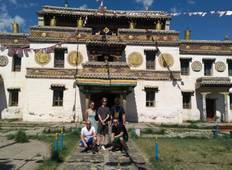 "“Our trip was almost cancelled due to a problem caused by a Mongolian local travel..."
"Beautiful countryside, pleasant people, great ger camps, interesting food, amazing..."